The EM10 is meant to turn the heads of those shopping for an entry-level DSLR, where instead Olympus will offer them a comfortably smaller body with still respectable stabilisation, Wifi, a tilting screen, 8fps shooting and the joys of a native live view system with its fast single AF and cracking face detection. The Olympus OMD EM10 is a mid-range mirrorless camera based on the Micro Four Thirds standard. Announced at the end of January 2014, it’s the third OMD model from Olympus, which means it’s styled like a mini-DSLR with a centrally-positioned viewfinder hump. Rather than replacing the existing EM5 or slotting between it and the flagship EM1, the new EM10 is positioned as a more basic model at the bottom of the OMD range, although this still means it’s pitched at a higher level than budget mirrorless cameras. At first glance the EM10 looks very similar to the EM5 and indeed it shares some of that model’s specifications, including the same 1440k dot electronic viewfinder, same size 3in tilting screen, the same 16 Megapixel sensor and an AF system rated at the same speed, and while the continuous shooting is 1fps slower, it’s still quick at 8fps. It also inherits the built-in Wifi capabilities of the flagship EM1 allowing you to remote control the camera with a smartphone, and additionally shares that model’s image processor, along with its higher resolution screen panel and a viewfinder which adapts its brightness. Unlike either the EM5 or EM1, it’s also the first OMD with a built-in flash, and despite appearances, it’s slightly smaller than the EM5 as well. So far with its built-in Wifi and flash, adaptive viewfinder brightness and higher resolution screen, the EM10 sounds like a minor upgrade to the EM5, but there’s two other important differences. All the OMD cameras feature built-in stabilisation that works with any lens you attach, but while the EM5 and EM1 boast a five-axis system, the EM10 is equipped with a simpler three-axis system. Also while the EM5 and EM1 are weather-sealed, the EM10 is not; indeed its build also feels less substantial than the EM5. These two differences position the new EM10 as a lower-end proposition to the EM5, but also allow it to come in at a lower price point while ticking many of the boxes of those looking for a capable but affordable mirrorless camera. The EM10 is expected in February in silver or black for 529GBP body only or 699GBP with a new 14-42mm kit lens which features a motorized collapsing design, making it the slimmest kit lens to date. Keep reading for my initial thoughts! The OMD EM10 represents a good solid specification for a mid-range mirrorless camera, sporting a small body with built-in stabilisation that works with any lens you attach, a decent viewfinder, tilting screen, built-in Wifi and a popup flash. As such it makes sense in the Olympus range and should greatly appeal to the target audience of those weighing up an entry-level DSLR against a mirrorless camera. Knowing what we know about the EM5 and what the EM10 inherits from it, I’d say it looks like a sensible and tempting camera for the target audience. This wouldn’t be a news analysis without a whinge though and across the next two paragraphs I’ll represent existing OMD EM5 owners who were hoping for an upgrade pitched somewhere between their camera and the flagship EM1. After all while the EM1 is a lovely camera, it is noticeably bigger than the EM5 and anyone who’s already satisfied with the ergonomics and controls of the original model may find the EM1 unnecessarily large and complicated. They may also not need EM1’s new sensor with its embedded phase detect AF points which mostly benefit legacy Four Thirds lenses – and besides if they’re into long exposures they may prefer the older EM5’s sensor which in a lucky break manages to score fewer hot pixels when shooting without noise reduction. So what many EM5 owners really want is the same body as before, crucially retaining the weather-sealing, five-axis stabilisation and same sensor, but sporting the EM1’s bigger and more detailed viewfinder, built-in Wifi, 1/8000 shutter and focus peaking. Okay, I’ll come clean, that’s actually what I’d like, but I bet I’m not alone. But of course the EM10 is not meant for me, nor any of the army of existing EM5 owners. Sure if you fancy sacrificing your weatherproofing and more sophisticated stabilisation in favour of built-in Wifi, flash and a slightly smaller body, then go ahead, but I suspect confirmation of the EM10 specifications will convince EM5 owners to either upgrade to the EM1 or be happy with what they’ve got. Remember the EM10 is meant to turn the heads of those shopping for an entry-level DSLR, where instead Olympus will offer them a comfortably smaller body with still respectable stabilisation, Wifi, a tilting screen, 8fps shooting and the joys of a native live view system with its fast single AF and cracking face detection. I reckon it has the potential to do very well, although while mirrorless owners will know it offers a good step-up, this end of the market is driven by price and some buyers will want it to hit a lower point before they’ll bite. Once again The EM10 is expected in February in silver or black for 529GBP body only or 699GBP with a new 14-42mm kit lens. Prices will settle over time, but at launch the EM10 will be pricier than its closest Micro Four Thirds rival, the Panasonic Lumix G6 which is also a cracking alternative to an entry-level DSLR. PS – Olympus also launched the EM10 alongside two new lenses: the motorized collapsing 14-42mm kit zoom and a 25mm f1.8, the latter completing its collection of f1.8 primes and offering a slightly cheaper alternative to Panasonic’s 25mm f1.4. 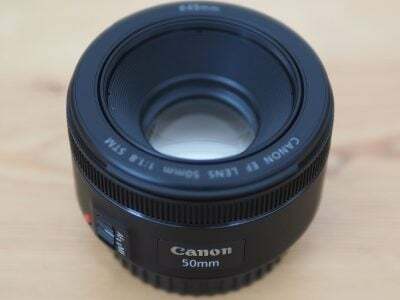 Priced at 369 GBP though, it’s still considerably more expensive than the budget 50mm f1.8 lenses available for DSLRs which also deliver a shallower depth of field. I’d expect the Olympus 25mm f1.8 to out-perform a budget 50mm f1.8 in some respects, but the fact is there’s still no dirt-cheap native Micro Four Thirds primes.